The Zirlott Family, fifth-generation Gulf Coast shrimpers, has found that many of the country’s finest restaurants will shell out for their farm-raised oysters. Because of their look and their taste, the oysters are being shipped to some of the best restaurants in New Orleans, New York, Atlanta and Houston, as well as states such as Maine, Maryland and Pennsylvania, and the family has increased production from 25,000 oysters in 2013 to about 800,000 this year. The world may have become Brent and Rosa Zirlott’s oyster, but then their oysters are becoming the world’s. 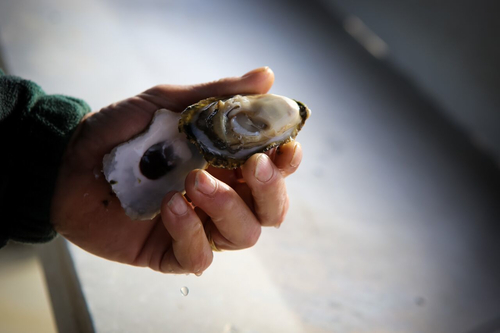 Their company, Murder Point Oysters, is reinvigorating the Alabama oyster business. In the process it has taken Alabama from a state that, since Hurricane Ivan severely damaged its oyster beds in 2004, has imported the majority of its oysters from Louisiana, Mississippi and even Texas to one that now exports oysters to some of the best restaurants in New Orleans, New York, Atlanta and Houston, as well as states such as Maine, Maryland and Pennsylvania. The Zirlotts and Murder Point Oysters have developed the farm-raised oyster market — rapidly developed it. Since producing 25,000 oysters as part of a 2013 oyster-producing program, the company reached 800,000 this year. The family of fifth-generation shrimpers says that may just be the beginning. 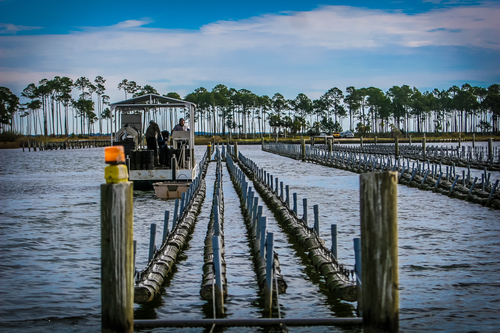 Around 2012, Auburn University was offering a program for oyster farming based on a long-line method developed in Australia. There were few takers. It takes a lot of faith to invest time and resources in a new industry, and many businesses balked at making that commitment to an industry that had no proven success in the U.S., Rosa Zirlott said. But the Zirlotts were looking for a way to diversify their shrimp business and decided to give it a try. She and her husband talked to their son, Lane, captain of their shrimp boat, and he agreed to become part of their oyster farm project. Beginning with 25,000 oysters, they have grown an ever-increasing number of oysters because the demand has just kept increasing. She said one of the reasons for the high sales is the fact that purchasers knew the Zirlotts didn’t just have oysters, but they also had pride in their products. Customers also buy their oysters because they are beautiful. She said because they periodically pull their oysters out of the water, it kills what grows on the outside of the shell, and the control they have by farming the oysters makes the oysters consistent in size with beautiful shells. That allows for impressive presentation, which appeals to many of the country’s top seafood restaurants. But Rosa Zirlott said a quality just as important as appearance in their oysters’ popularity is the flavor. Then there is the catchy name. In selling to restaurants across the country, Murder Point has had to overcome bias against Southern oysters. “Some parts of the country had a negative perception of Southern oysters, because people thought the best oysters had to be a cold-water oyster, so we had to educate people that Southern oysters were not only safe, but could rival oysters from anywhere in taste,” Zirlott said. They also have more workers eager to join the company. “We have another son who wants to get in it, and grandchildren,” she said.